The new and improved CHAT now allows you to add up to ten custom questions of your own for a $49 upgrade. While you're gathering feedback from your church body on the benchmarks of church health, why not add a few specifics of your own at the click of a button? Find out what percentage of the congregation is currently in a small group, their comfort level with bringing an unchurched friend to church, how far most people live from the church, are gas prices affecting their attendance, propose new service times, etc. These are just a few examples. Get creative! EXAMPLES: Need some ideas to get you started on writing your own custom questions? Click here for a few examples of what other churches have done . 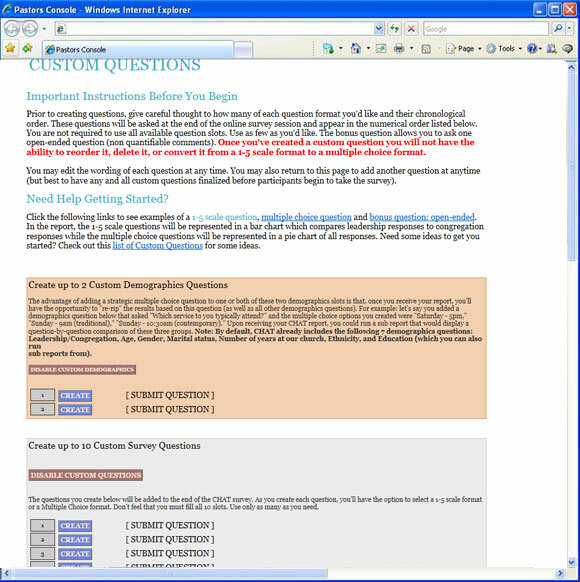 Here's a screen shot of what the Custom Questions Module looks like. It's very easy to use.